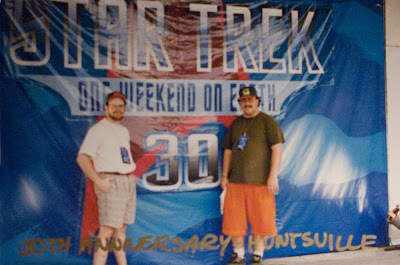 Over the coarse of the first couple years we had attended the local Trek Con's in Detroit, more specifically at the Dearborn Civic Center.... There were many kewl moments to be sure... but now it was time to take our products to the con of cons's! The 30th Anniversary Party held by Paramount and NASA at the Manned Space Flight Center in Huntsville Alabama! There was so many great moments that weekend its hard to chronicle them all. 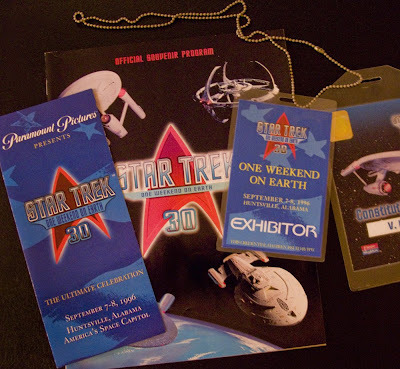 A few that stuck out for me included my first time meeting Leonard Nimoy, Kate Mulgrew, Micheal Dorn and several real live astronauts including Edwin "Buzz" Aldrin the second man to walk on the surface of the moon. During the two days we were there we sold and signed hundreds if not thousands of posters, including to some of the trek cast themselves who visited our table. Because DS9 had just been published we got allot of attention from the cast of the show... most notably Rene Auberjonois, Armin Shimerman and the fantastic Chase Masterson who was very down to earth person... I believe I traded a signed DS9 poster for a autographed picture of her!